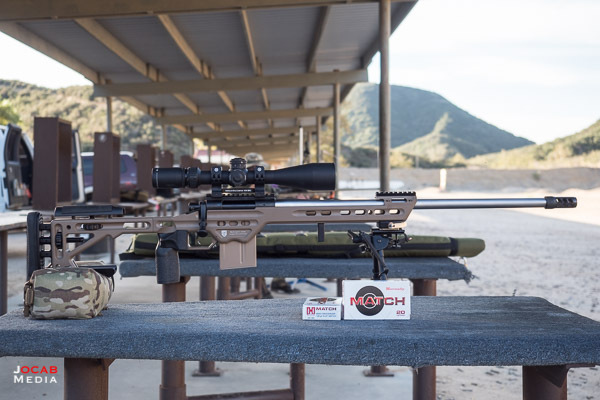 After nearly eight months since the inception of my 2017 precision rifle project, I finally was able to make it out to the range and live fire the completed rifle. 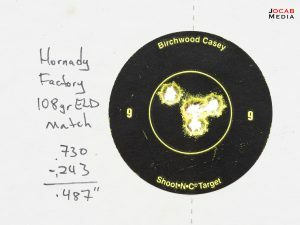 I received an order for some Hornady 6mm Creedmoor 108gr ELD Match ammunition the other day, so I fired the Hornady factory ammo as my first rounds through the gun. Surprisingly enough, I had some difficulty chambering some of them. The bolt did not close easily, and I had to push forward on the bolt to get it to cam. At the time, I assumed it was headspace issues or a tight chamber. My handloads were chambering just fine. I ended up firing twenty rounds of the Hornady factory ammunition. The average velocity was 2998fps, with a poor extreme spread of 55.86fps and standard deviation of 18.21fps. According to the box, this ammunition is supposed to run 2960fps. This is actually a bit mild all things considering. The groups were actually pretty decent. They hover right around half-minute of angle. The different in point of impact is because I was still tweaking the zero-stop adjustment in the Vortex Optics Razor HD AMG scope. 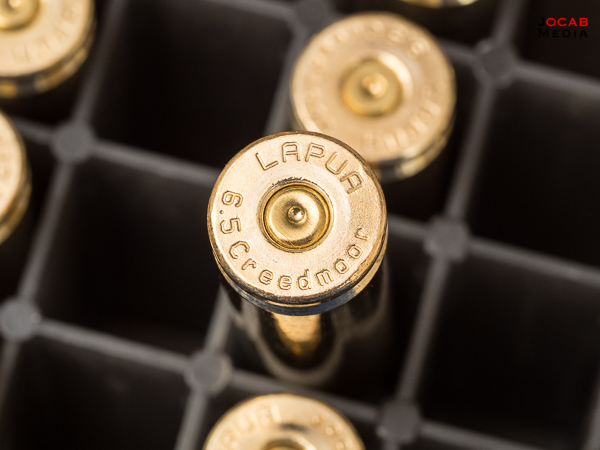 The “high speed, low drag” 6mm cartridges usually push 3050fps and faster. Hot rodded 6mm makes for some flat shooting trajectories and do quite well in the wind when combined with the high BC bullets being made by bullet manufacturers. Ideally, I would like to be in the 3050 to 3100fps range with my handloads in a 24 inch barrel. If I can go faster, 3100+ might be nice to maximize for 1000 yards and beyond. 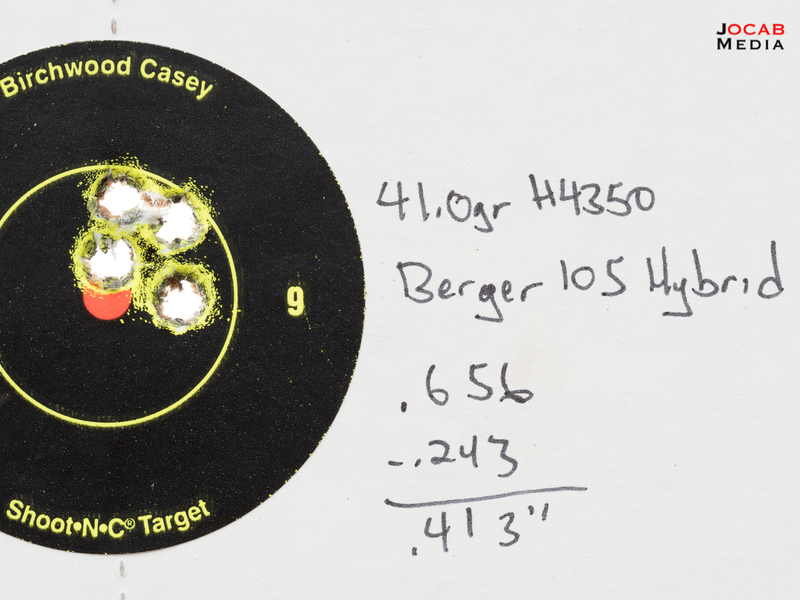 The charge weights tested were: 40.3gr, 40.7gr, 41.0gr, 41.3gr, and 41.7gr. I loaded five rounds of each. 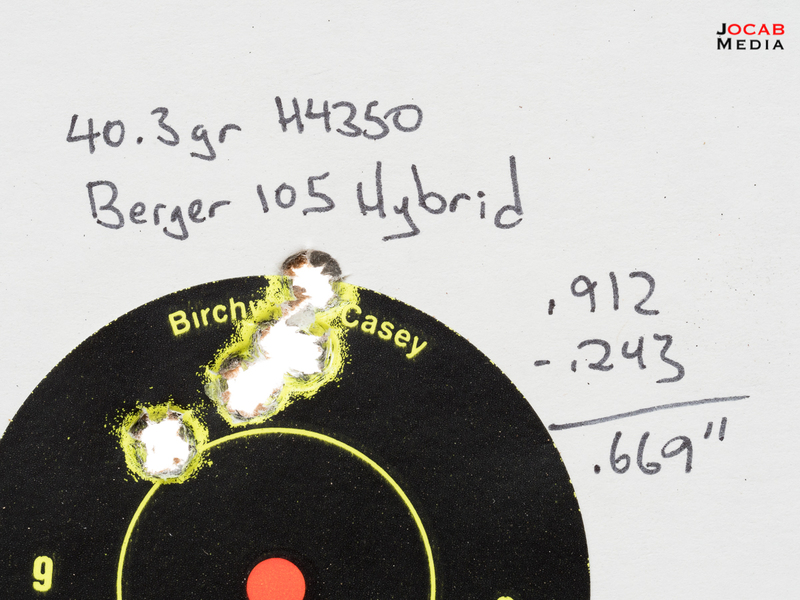 Using the Hornady Overall Length Gauge tool, I arrived to a base to ogive length of 2.215″ with the Berger 105gr Hybrid Target. This equates to about a 2.805″ overall length (base to tip). 40.3gr of H4350 resulted in an average velocity of 3008.96 fps, with a standard deviation of 9.18 fps and extreme spread of 21.22 fps. The group size is a respectable .67 MOA. Not bad, but not great. 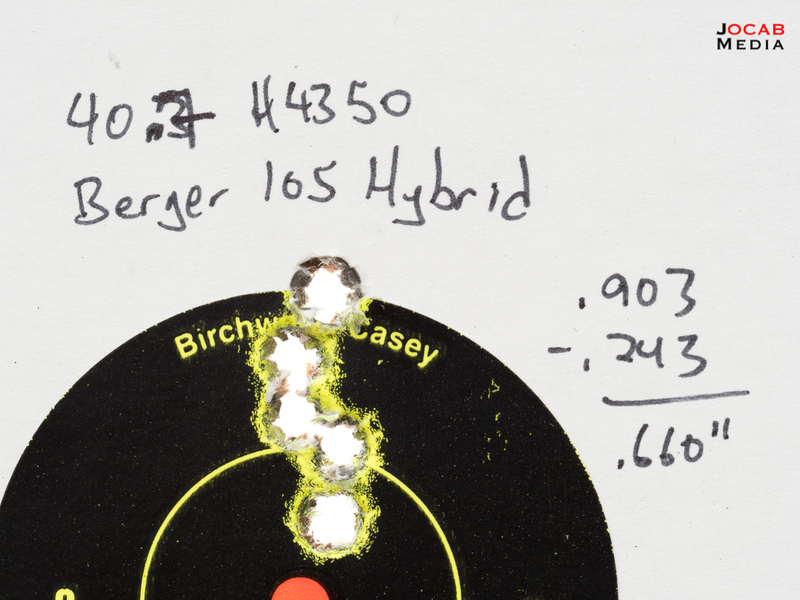 40.7gr H4350 yielded an average velocity of 3046.74 fps, with a standard deviation of 5.68 fps and extreme spread of 13.6 fps. The harmonics of this group resulted in some serious vertical stringing, although with a group size of .66 MOA. Definitely a node to be avoided. 41.0gr of H4350 resulted in an average velocity of 3058.89 fps, with a standard deviation of 5.25 fps and extreme spread of 11.39 fps. 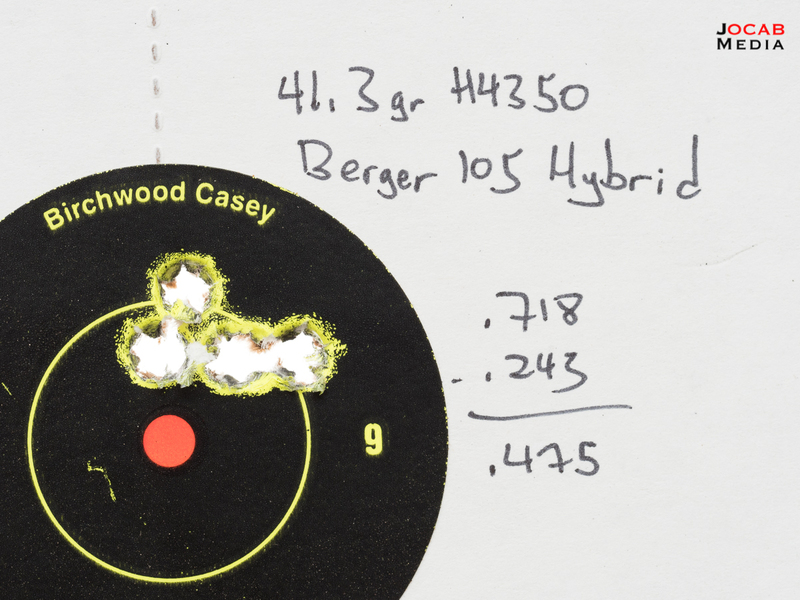 The group is around .41 MOA, but is only a 4-shot group due to a dud primer. 41.3gr of H4350 resulted an average velocity of 3078.39 fps, with a standard deviation of 4.85 fps and extreme spread of 11.68 fps. The group size is .48 MOA. Lastly, 41.7gr of H4350 yielded an average velocity of 3101.64 fps, with a standard deviation of 16.12 fps and extreme spread of 43.1 fps. The SD and ES for this load shot up significantly compared to the other strings. It may be due to the way I shot this group. It was the last few rounds I needed to shoot and the rest of the range was wanting to call a line break, so I sped through the string faster than the others. The group size for this string is .62 MOA, but actually more impressive due to the fact the lone shot below the rest of the group was a called pulled shot. I want to experiment more with the 41.3gr load. I think that this is a good node for this rifle, and if I test in more controlled situations, I think I will find this load is the right node in terms group size, but I also think it will turn out to be a good node in a ladder test when I get an opportunity to conduct one. Now going back to the difficulty I had chambering the factory Hornady ammo. 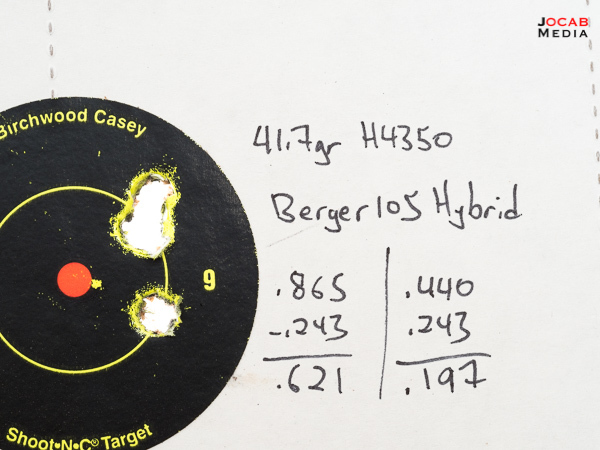 When I got home from the range, I did a quick measurement of the headspace of the unfired rounds, and it actually came in under the headspace of a fired case (and was close to the headspace of my handloads). Since the headspace checked out, the only other thing is the base to ogive length. So I used a bullet comparator and measured the base to ogive length of the factory Hornady ammo. That length exceeded the base to ogive measurement I obtained using the Berger 105gr Hybrid Target when seated to the lands by .0023″. It would appear that the Hornady factory ammo is jamming into the lands. 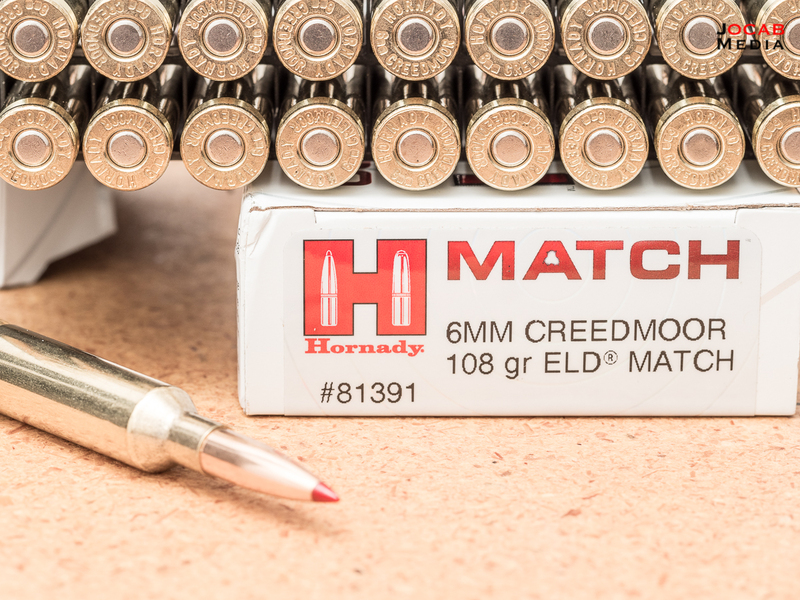 Measuring the Hornady 6mm Creedmoor 108gr ELD Match factory rounds, the base to ogive length is around 2.238″ with an overall length (base to tip) of around 2.785″. Generally, you would check maximum base to ogive measurements for each specific bullet. Since I don’t have any Hornady 6mm 108gr ELD Match bullets, I pulled bullets from a coupe of factory rounds with a kinetic tool. 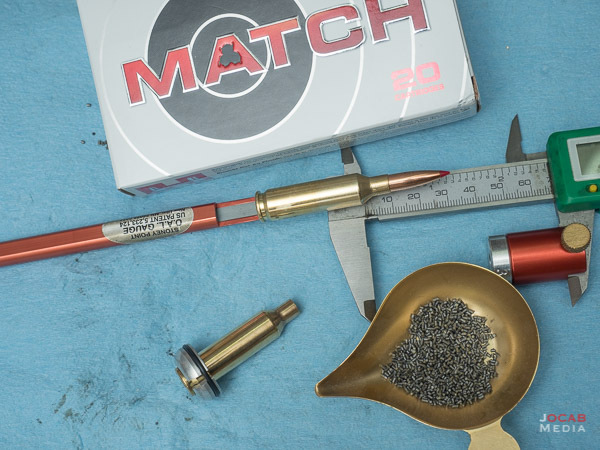 When I measured the base to ogive measurement with a Hornady Overall Length Gauge tool, it came out to 2.216″, which is right in line with the Berger 105gr Hybrid measurements in my chamber. I thought about it for a second and decided to chamber some of the Hornady factory rounds and measure them afterwards. Shockingly enough, the bullets were being seated deeper into the case on bolt close to a base to ogive length of 2.205″ and an overall length (base to tip) of around 2.752″. 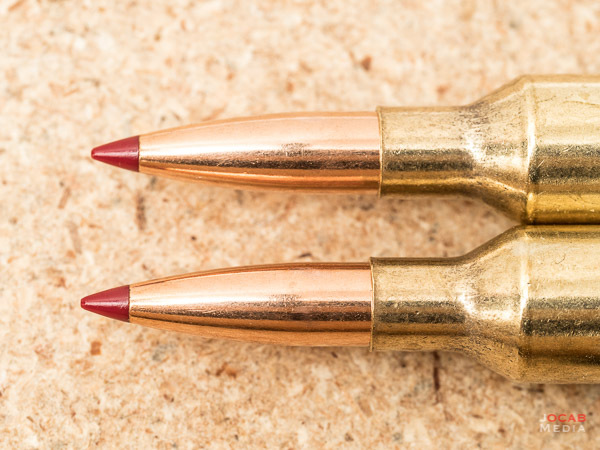 This is 0.033″ shorter than the original Hornady factory round. Note the faint rub marks on the jacket past the ogive, closer to the base. The re-seated base to ogive length of 2.205″ is disconcerting because it is ten-thousanths (0.010″) shorter than what I measured as the base to ogive length with the Hornady tool. I think the difference here is slightly affected by the fact that the Hornady tool is actually reliant on the headspace and dimensions of the modified case used for the tool. When you insert the tool into the chamber, how deep the case goes into the chamber is determined by the headspace as well as the body dimensions. Granted, the headspace of the modified 6mm Creedmoor case is 1.536″, which is only five-thousandths (0.005″) less than the factory ammo headspace. So the question is, is my base to ogive length actually 2.205″ or is it 2.215″. It is possible that I am jamming too hard into the lands with the tool when I conduct the measurement. A more old school method to measuring the distance to lands in a rifle is to actually take a resized case, cut vertically down the neck of the case so the bullet can move freely with a little pressure, seat it long, chamber it in the rifle, and then measure the ejected dummy round. I may end up doing this. 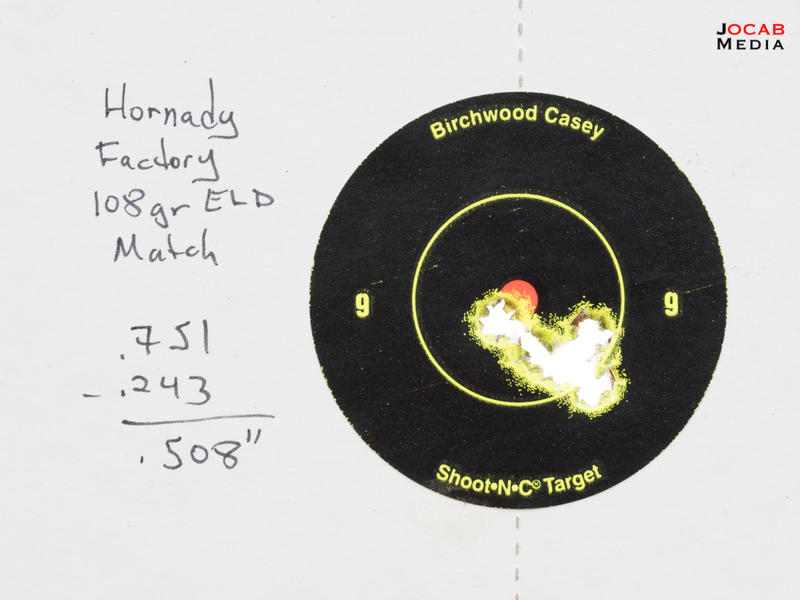 But right now, it is obvious that the Hornady 6mm Creedmoor 108gr ELD Match factory ammo as shipped from the manufacturer is too long for my chamber. When I had this gun barreled and chambered, I specifically indicated I wanted the chamber cut with a reamer to optimize for the Berger Bullets 6mm 105gr Hybrid Target bullet. I was seating the first sets of handloads with the Berger 105gr Hybrid to the 2.215″ base to ogive measurement, which resulted in a base to tip overall length of about 2.805″. Assuming I adopt the 2.205″ base to ogive measurement as the true distance to lands metric, this puts me at 2.795″ overall length (base to tip). I am planning another range trip to do more testing. I will make more reloads with the Berger 105, but I will focus on the 41.0gr to 42.0gr range with H4350, and I will seat to a base to ogive length of 2.205″. I will also re-seat (seat deeper) the bullets on the factory Hornady ammunition. This can actually increase pressures, but a .0033″ deeper seating depth should not result in a catastrophic scenario. A quick aside to the powder in the Hornady 6mm Creedmoor 108gr ELD Match factory cartridge, it appears to be 40.1gr of an extruded powder. I tried to compare this pulled down powder to Varget, H4350, RL15, and RL17. None of them is a visual equal. 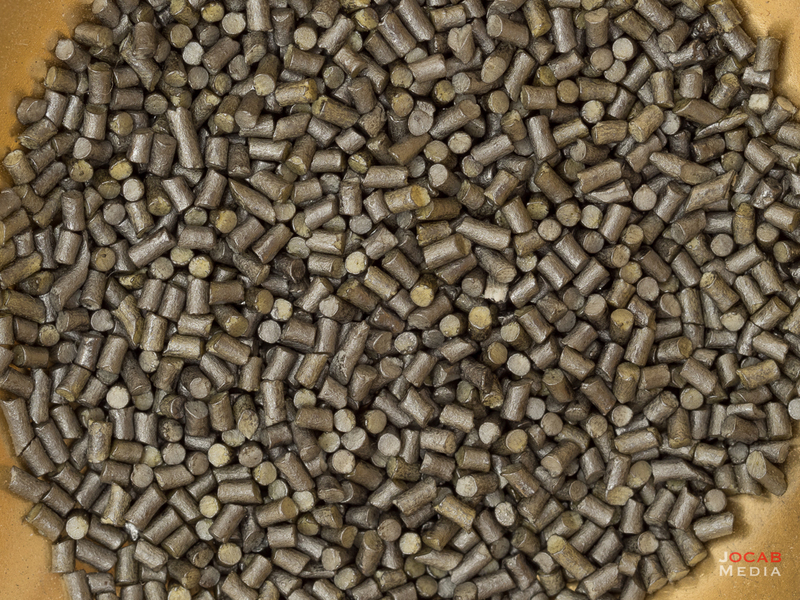 Most ammunition manufacturers use industrial produced powders with a burn rate at a requested specification, and not consumer branded powders. Very early on, Hornady actually was using H4350 in their factory 6.5 Creedmoor A-Max ammo, and literally put the reloading recipe on the box label. But this is not the case, anymore. The weather is getting squirrelly in Southern California. The windy days are starting to pick up, so picking a good day to shoot in a good controlled condition is becoming more difficult. Hopefully I can shoot for valid data this weekend, or sometime in the next week or so. Stay tuned for further range reports as well as a final summary of the build and my opinions of the rifle in general after I give it a good breaking-in. Round Count as of 2017-10-17: 45.